When the Muslim Society of Toronto (MST) opened its Islamic Centre in 1961, it served a tiny community. The earliest presence of Muslims in Canada was recorded in the 1871 federal census, when 13 people recorded Islam as their faith. A trickle of Albanians, Lebanese, Syrians, and other ethnicities from the Ottoman Empire crossed the Atlantic in the years leading up to the First World War, adding up to around 1,500 Muslims across the country by the time hostilities broke out in 1914. Many initially found work as unskilled labourers or peddlers. The Canadian Muslim community barely grew during the interwar years, due to a combination of restrictive immigration policies and those who returned to their homelands following the dismemberment of the Ottoman Empire. After the Second World War, numbers were boosted via the arrival of refugees from Communist regimes in the Balkans and a small group of professionals from elsewhere. Among the early arrivals in Toronto was Regip Assim, who fled Albania with his brothers after participating in a failed independence movement prior to the First World War. Settling in Toronto, the Assims found that their religion’s association with the perceived barbarism of the Ottoman Empire, which fought against the Allies during the war, hampered employment attempts. They settled into candy making, eventually operating the High Park Sweets restaurant on Bloor Street. Assim was involved in the formation of the Albanian Muslim Society of Toronto in the early 1950s, becoming president when it dropped “Albanian” from its name a few years later. 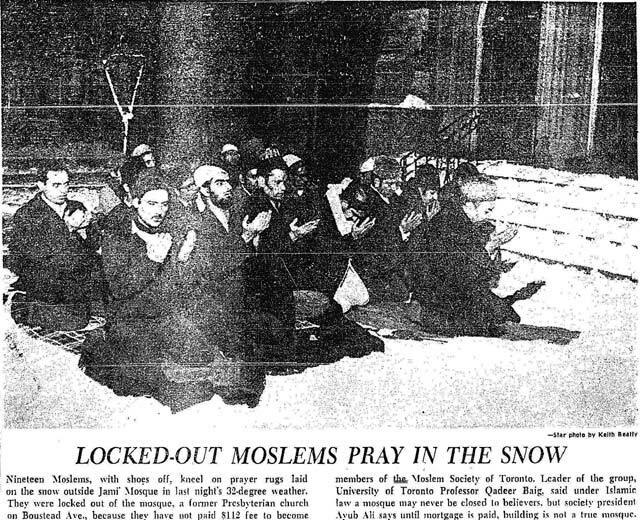 Interviewed by the Star in 1959, Assim estimated there were around 400 Muslims in Toronto. Canada’s first mosque, Al-Rashid, opened in Edmonton in 1938, but our city still lacked one for decades. Occasional services were held at Club Kingsway in Swansea, but most worshipped at home. The search for a permanent mosque space, during which several churches were considered, culminated in the purchase of 3047 Dundas West. An oral history project called Mosque One, assembled by Tessellate Canada in 2009,preserved memories of the mosque’s members. They depict a congregation where cultural diversity was tolerated, moderation was promoted, and women played a key role in fundraising and operations. Besides a prayer area, the mosque included a small library and a Sunday school, designed to help children to retain their cultural and religious identity. Toronto Star, June 27, 1964. For Toronto’s Muslims who gather for public prayer (average attendance 50) there is the call to prayer, the “obligatory” prayers which are said in Arabic by the believer as he faces towards the holy city, Mecca (east-south-east of Toronto), readings from the Koran (the Islamic Bible) in Arabic, with an English translation, and finally a session in which the practical affairs of the society are considered. Perhaps the most prominent visitor to the mosque was Malcolm X, who dropped by while visiting Toronto for an appearance on CBC TV’s Front Page Challenge in January 1965. After dining with members of the MST, he spoke at the mosque and was presented with a gold-frame Arabic inscription. The visit occurred just over a month before Malcolm X was assassinated. The MST soon experienced growing pains. Looser immigration policies prompted a rise in new members, especially from Asia and the Muslim community across the city grew to 5,000 by 1969. Philosophical differences arose between older, liberal members and more conservative arrivals, heralding a long series of splits into new organizations such as the Islamic Foundation (which set up quarters across the city at 182 Rhodes Avenue). Mostly, the congregation grew too large for the mosque to handle. 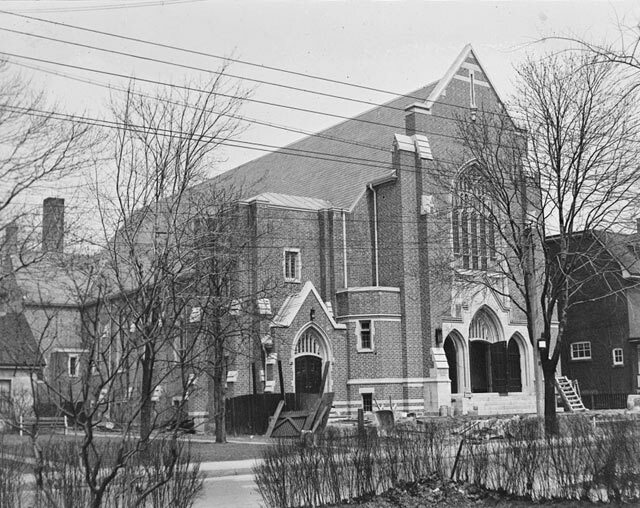 High Park Presbyterian Church, Boustead Avenue, April 11, 1930. City of Toronto Archives, Globe and Mail fonds, Fonds 1266, Item 19783. With financial aid from King Faisal of Saudi Arabia stemming from a personal appeal by MST president Dr. Mirza Baig, the former High Park Presbyterian Church at 56 Boustead Avenue was purchased for $125,000. Renamed Jami Mosque, the site opened for worship in February 1969. Besides the new mosque, the MST also purchased a 1,000 grave lot in Glendale Memorial Gardens as a Muslim burial ground. Divisions among members continued, resulting in protests and legal intervention. 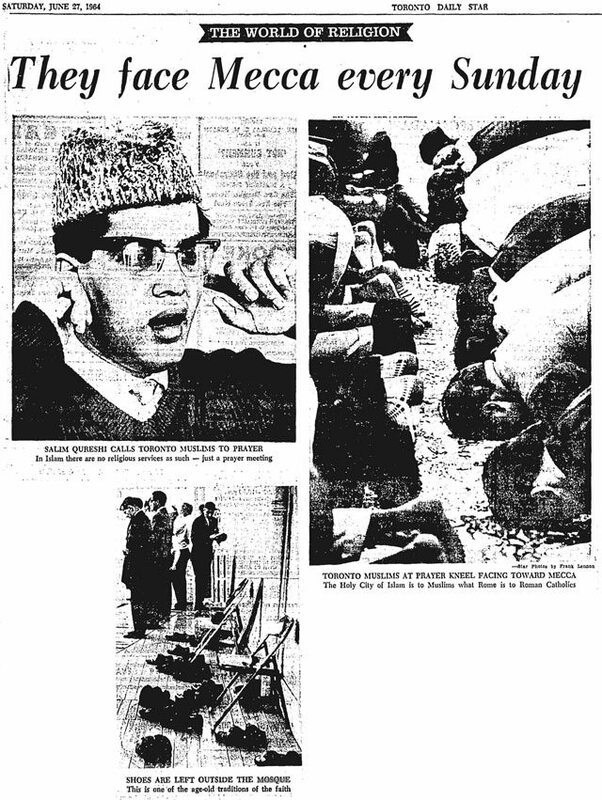 Front page newspaper photos in January 1972 depicted 19 people praying on rugs atop snow in zero degree weather outside Jami Mosque. The protestors, including former MST president (and University of Toronto Islamic Studies instructor) Baig, were denied entry over failure to pay $112 membership fees created to help pay off the mortgage. Baig claimed that under Islamic law mosques were never closed to believers, while MST officials said that until the building was paid for it couldn’t be considered a proper mosque. Toronto Star, January 21, 1972. 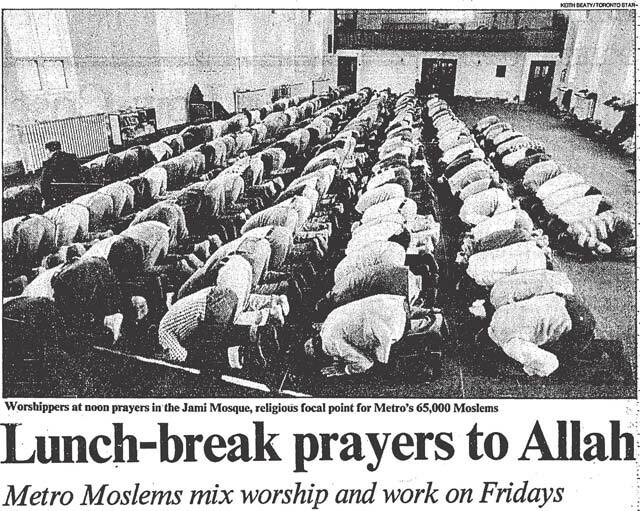 Note ongoing obsession Toronto media had about the Muslim practice of removing one’s shoes while praying. Baig also complained that police committed sacrilege by stepping on prayer rugs with their shoes still on while serving two summonses for trespassing. Not that local legal authorities seemed to have much respect for local Muslims at the time — a front page story in the Star in April 1972 reported on a justice of the peace who used the phrase “Moslems be damned” while ruling on a routine traffic court case. The battles between the MST and Baig’s group came to a head in January 1973, when Justice R.E. Holland dismissed one action with costs and a counterclaim without costs. The hearing revealed the depths of divisions between a primarily Pakistani group, which wanted to keep the mosque open all day for worship, bar social gatherings, and enforce a dress code for women, and a primarily Albanian group who wanted to maintain Friday and Sunday prayers only, partly for financial reasons. “The conflict between the groups increased in intensity to the extent that the Albanians, because of abuse and disturbances at the Boustead property,” Holland observed, “have now for the greater part moved away and perform religious observances in a schoolroom rented for the purpose, apparently on Sundays only.” Holland suggested the Pakistani group buy out the Albanians, allowing the latter to purchase another space. Jami Mosque was soon sold to the Islamic Society of North America. The Albanians eventually settled at 564 Annette Street, which bears a plaque dedicated to Assim. While the infighting surrounding Jami Mosque carried on, Metro Toronto’s Muslim population continued to grow, reaching 50,000 by 1976. Mosque construction grew, especially in the suburbs. New waves of immigration continued through the rest of the decade, from the arrival of people expelled by Idi Amin from Uganda in 1972 (which helped establish the local Ismaili community) to refugees fleeing a trio of hot spots in 1979: the Iranian revolution, the official assumption of power by Saddam Hussein in Iraq, and the Soviet invasion of Afghanistan. Toronto Star, January 6, 1979. Additional material from Oil & Water: Two Faiths: One God by Amir Hussain (Kelowna: Wood Lake Publishing, 2006); The Religions of Canadians, Jamie S. Scott, editor (Toronto: University of Toronto Press, 2012); The Muslim Community in North America, Earle H. Waugh, Baha Abu-Laban, Regula Qureshi, editors (Edmonton: University of Alberta Press, 1983); the March 14, 1959, April 4, 1960, February 22, 1969, April 26, 1969, and January 19, 1973 editions of the Globe and Mail; the November-December 2010 edition of Islamic Horizons; the June 27, 1964, January 21, 1972, March 30, 1972, April 20, 1972, June 7, 1988, and November 7, 2009 editions of the Toronto Star; and the September 2005 edition of the Village Gleaner.